The Dizi 笛子 (bamboo flute) is the traditional Chinese flute. They are made of bamboo, which explains why they are sometimes known by simple names such as “Chinese bamboo flute”. But it is also possible to find dizi made from other kinds of wood, or even from stone. 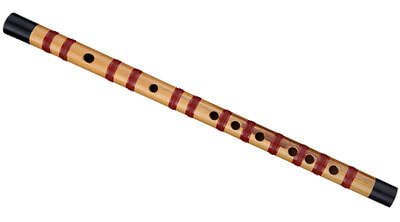 The dizi also has a very different additional hole than most other flutes. A special membrane called dimo 笛膜, made from an almost tissue-like shaving of reed, is made taut and glued over this hole. The dimo covering this special hole gives a distinctive resonating effect on the sound produced by the dizi, making it brighter and louder, and adding harmonics to give the final tone a buzzing, nasal quality. Dizi have a relatively large range, covering about two-and-a-quarter octaves. The player plays the instrument by blowing across the mouthpiece and produces different notes by stopping the six holes found in the rod. The family has several sizes of bamboo flutes. The most common ones used in a Chinese Orchestra include the bangdi 梆笛, qudi 曲笛, and xindi 新笛. The bangdi is pitched similar to the Western piccolo while the qudi is pitched a fourth or fifth lower. The xindi sounds more mellow than its counterparts. Students usually start learning with one type of dizi and begin to learn other types as they advance to more higher level.